Richard McCullagh is a legal director at Patrick McHugh & Co Pty Ltd and Adjunct Lecturer in elder law at the College of Law. 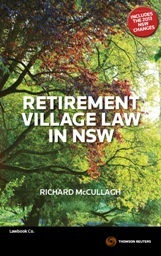 He is also author of Retirement Villages Law in NSW. Despite recent bad publicity and superficial complexity, retirement villages are a simple proposition: they are relatively cheap to move into and stay in, and expensive to leave. NSW arguably has the best regulation in Australia from the resident’s point of view. A good reality check is to compare living in a retirement village to an elder downsizing to a smaller home or unit in the suburbs, or a manufactured home estate. On 26 June 2017, the Four Corners program on ABC Television (‘4 Corners’) aired an exposé on retirement villages. Though a national broadcaster raising legitimate issues, almost all the content centred on two villages managed by the one operator, Aveo, in one state, Victoria. In late July 2017, no doubt in response, the NSW government commissioned Kathryn Greiner to oversee a ‘grass roots’ consultation process with village residents and to report back in December. That report has yet not been made publicly available. The operation of retirement villages is tightly regulated in NSW under the Retirement Villages Act 1999 (NSW) (‘Act’) and, as of 1 September 2017, the Retirement Villages Regulation 2017 (NSW) (‘Regulation’), replacing the 2009 regulations. The NSW Act contains provisions which deal with the kinds of issues raised in the 4 Corners program. The ACT and Queensland also have robust and comprehensive regulatory regimes for retirement villages, but the same cannot be said of other jurisdictions in Australia. Victoria and the Northern Territory get the ‘wooden spoon’ in terms of the issues raised by 4 Corners. As a ‘reality check’, brief comparisons with an elder pursuing other popular accommodation options will be made below: downsizing to a smaller home in the suburbs or moving into a manufactured home park, now amorphously known as a ‘residential community’. Cheaper entry price: As a rule-of-thumb, the entry price of a dwelling in a retirement village is around 80–85 per cent of a comparable residence in the same locality. Of course, this needs to be checked on a case-by-case basis. While stamp duty is a major cost of downsizing to a smaller home, leases and licenses are exempt in NSW. Whatever the tenure, the market value of the village unit is an exempt asset for the purposes of the age pension, government-subsidised home care and capital gains tax. These revenue features also apply to a downsized home and a manufactured home. The purchase price of the latter will generally be cheaper again than a village dwelling. Complex contracts – well, get good advice: Village contracts, at least in the for-profit sector, are typically 80 – 100 pages. NSW is the only jurisdiction with a mandatory standard form contract. This is less than 20 pages (Schedule 2 of the Regulation), easy to follow and the rest of the provisions cannot be inconsistent with this. Most elders downsizing wouldn’t think twice about engaging a solicitor or conveyancer to act on their sale and purchase. Obviously, the same should apply on moving into a retirement village, even more so. It is not just a conveyance, but involves a long-term relationship with the operator about the provision of, and payment for services and facilities, and substantial fees on leaving. Cheaper living costs: Economies of scale are usually achieved in a medium density residential community, housing a population seeking a narrower range of services and facilities than might apply in the wider community. Furthermore, NSW has a number of additional regulatory features. Collectivised costs: Ongoing costs covered by the residents’ (usually) monthly payments must cover building insurance and generally includes building and gardening maintenance, and council and water rates for their unit and the whole village. The collectivised cost of providing these general services apportioned between individual residents is invariably cheaper than for a stand alone house in a comparable suburb. Free Capex: The Act obliges a village operator to see to and pay for replacements of items of capital, included in dwellings, but prohibits the use of recurrent charges for this. If a resident’s hot water service, for example, no longer functions due to fair wear and tear, that must be rectified and paid for by the operator using other revenues. After leaving: Six weeks after permanent vacation, recurrent charges are either no longer payable by the resident, or are shared with the operator in the same proportion as capital gain is under their village contract. None of these benefits apply to a stand-alone home in the suburbs. A park resident will enjoy communal cost sharing but is usually solely responsible for all capital items in the home and for payment of site fees in full until a new resident buys the home or moves in. Surplus to be rolled over: Finally, recurrent charges are not a source of profit for village operators. Subject to a few very limited exceptions, the Act obliges the operator to fund a deficit from other revenues and, conversely, to carry forward a surplus into the next year’s budget. If not increased by a fixed formula, an increase that exceeds CPI requires the operator to obtain the consent of residents through a majority vote or, failing that, by an order from the NSW Civil and Administrative Tribunal (‘NCAT’). Neither is an appealing prospect for an operator and efforts to contain cost recovery to within CPI are often successful. This can be contrasted with a manufactured home park, where rent is the primary source of revenue for the park owner and largely market-determined without any formal involvement of residents. For elders on fixed incomes, this can be crippling. A resident, or 25 per cent of park residents if applying for mediation, must marshal evidence to challenge a rent increase at NCAT. Residents are ‘trapped’! : Another source of complaint on 4 Corners was that a resident’s refund due on leaving the village is likely to be so depleted that moving to alternative accommodation is ‘impossible’, due mostly to ‘hidden departure fees’. This is a plausible financial scenario but it is not a legitimate basis of complaint as long as the resident was advised to, and given a reasonable opportunity to, seek independent and competent legal advice before entering the contract. Departure fees: Departure fees usually, and need only, comprise a simple calculation of a specified annual percentage for up to a specified number of years of the price paid by the resident leaving, or payable by the new resident now moving in. More arcane formulae do not assist the resident, advisor or trust in the industry. Generalising, a payment of around one third of the amount paid, or payable, will be the maximum fee. Under the NSW Act, the departure fee must be calculated on a daily basis, as opposed to monthly or annual increments, and cease to further accrue on the earlier of permanent vacation or the maximum period stated in the contract. Unlike Victoria, they don’t keep increasing. A departure fee may not be dissimilar in amount to a reverse mortgage subject to compounding interest secured against a downsized home to cover extra home care or a little spending money. Capital adjustments: Many operators share capital gains, and losses, with the resident. This is easily found in the NSW standard form contract. Improved transparency: As from 1 March 2018, the operator must complete a projection table showing fees and capital gain over time given certain assumptions in the disclosure statement (s 11(3)–(5) of the Regulation). This should further assist prospective residents and their advisors. Reinstatement: The only NSW story in the 4 Corners program was an apparently exorbitant bill for reinstating a unit on leaving. The Act prohibits an operator recovering from a resident more than the cost of rectifying damage beyond fair wear and tear. This may be improved by a new much more comprehensive condition report. (Part 3 of the Schedule 1 of the Regulation). Setting the sale price: While departure fees will deplete the funds available with which to relocate, another crucial factor in not being ‘trapped’ is for the resident (or his or her estate) to be able to set the sale price of the unit. Under the Act in NSW, this applies unless the resident instead has a right to be paid their refund in full within six months of moving out, even if a new resident has not moved in by then. Otherwise, the resident may set the listing price and engage in any lawful method of finding a buyer, including engaging a licensed real estate of their choice. Disputes: The final 4 Corners revelation to be mentioned here is the enormous cost in legal fees to take on the operator in any dispute. This is simply false in NSW (and Victoria), at least at first instance. NCAT (and VCAT) is a one-stop dispute resolution shop for virtually all grievances under the Act. Application fees are nominal, can be lodged simply on-line, the procedure is informal, legal representation is by leave only and costs orders are rare. Of course, if the matter proceeds to appeal, that is different. Generalising again, NCAT is a far superior forum to its predecessor, the CTTT. In NSW, an operator must disclose certain details of breaches under the Act and NCAT orders. This is bad publicity that most try to avoid. Despite the foregoing ‘comparatively clean bill of regulatory health’, two ongoing issues should be raised to finish. Refund guarantee: The No.1 disaster scenario for a retirement village resident is operator insolvency. At the least, there will be an uncomfortable hiatus while receivers try to negotiate the sale of the village to a competitor. At worst, a liquidator may disclaim leases and evict residents, who join the queue with other unsecured creditors for (part of ) their refund (see ss Corporations Act 2001 (Cth), ss 568–568D and Willmott Growers Group Inc v Willmott Forests Limited (Receivers and Managers Appointed) (In Liquidation)  HCA 51). Residents and the industry would benefit greatly from the NSW government setting up a refund guarantee scheme modelled on that which the Commonwealth has implemented in respect of the refund of refundable accommodation deposits by insolvent care providers of residential aged care facilities (see Aged Care (Accommodation Payment Security) Act 2006 (Cth)). This is funded by a modest impost on operators rather than tax payers and interest earned is applied to the administration costs. Tenancy inflexibility: The increasing incidence of blended families in retirement villages makes the usual insistence by operators’ lawyers that they take as joint tenants needlessly iniquitous. On the death of the first partner, the refund will not pass under his or her will but under the will of the survivor (which could subsequently be revised), or on intestacy. Complex and expensive documentation reduce this problem. A far simpler one for residents with children by prior partners is to take the lease as tenants in common in equal shares, or in proportion to their respective financial contributions to the in-going contribution.